Come join an fun evening with family and friends. Enjoy the belly dancer's exotic performances while you savor American and Chinese cuisine in the beautiful banquet hall of Great American Casino, Tukwila. From 10PM, our DJs will spin the wheel to popular Bollywood music with electro and house mix. Great American Casino's banquet hall has a large dance floor with plenty of lounging area. Dance your night away or lounge with your friends while you enjoy the music. 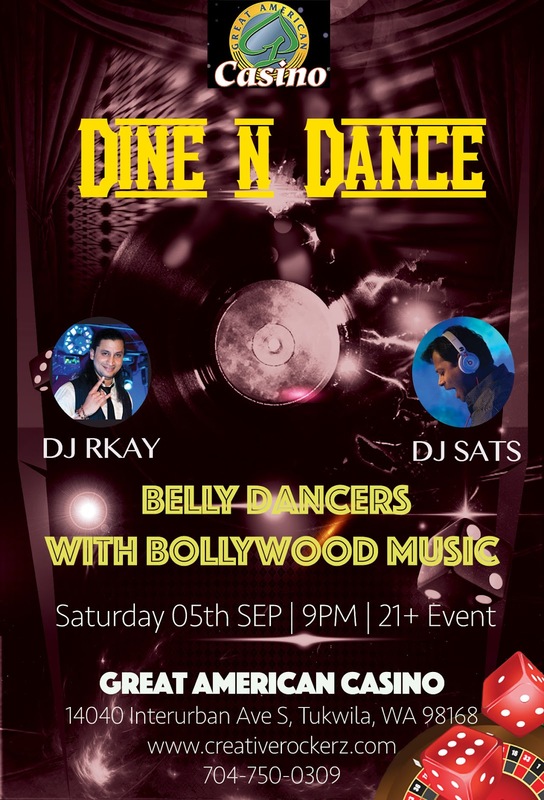 DJ RKay( Rakesh) brings you the Bollywood music with electro music influence. One of the experienced and finest Bollywood DJs..you surely cannot stop dancing to his music. Come be part of this BellyBolly night ! Belly Dance Performance at 9:30pm, so don't be late ! Click Pictures from our last Party here ! Please Note: Belly Dance Performance is at 10pm.